Taking Stanley Kubrick's '2001: A Space Odyssey' as a starting point, this exhibition invites us on a journey from the origins, through the present and into the future of human intelligence through one of our most ambitious projects: Artificial Intelligence (AI). Our most distant ancestors created rudimentary tools or technology, from stones and bones, and these played an important role in the survival of the species. Today we create AI computers and programmes, which corroborate the extraordinary advances in human knowledge and herald important changes in our societies. The film that provided the best outline of this transition is ‘2001: A Space Odyssey‘, by Kubrick, which was released fifty years ago. In its three sections, the cast includes both the four million-year-old hominids who invent the “first” weapon, as well as the HAL 9000 super-intelligent computer, the most advanced technology, which controls the Discovery spaceship and its crew. Asked about artificial intelligence, Stanley Kubrick wrote: “One of the most fascinating issues that arises when imagining computers smarter than humans is to what extent automatic intelligence deserves the same consideration as biological intelligence. One might be tempted to wonder in what way artificial intelligence is less sacrosanct than biological intelligence. And it might be difficult to choose a flattering conclusion in favour of biological intelligence”. Half a century after his film and the novel by Arthur C. Clarke, it seems more relevant than ever to rethink this question. Curated by Claudia Giannetti– one of the most relevant media art specialists – this exhibition is also divided into three themes: The awakening of intelligence, In the AI universe and The future of intelligences, and beyond infinity. The exhibition establishes links with scenes from ‘2001’, including supporting documents and original Kubrick scripts, and a selection of pieces and significant works that allow us to find out more about the relationship between humans and “thinking” machines. The narrative structure for this exhibition is connected by ten questions, which take into consideration important aspects regarding human intelligence and the potential of AI technology. With a special emphasis on the synergy between art, science and technology, the main purpose of this project is to present the evolution of human and artificial intelligence from its historic milestones, its current applications and fascinating perspectives of the future. 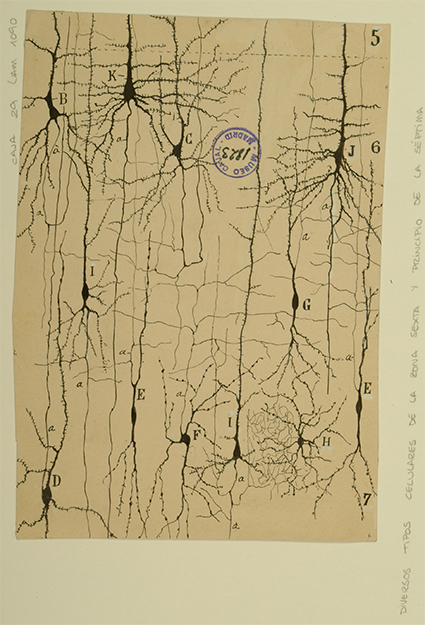 Scientific drawing of Santiago Ramón y Cajal, cell types of the 6th area and beginning of the 7th. Courtesy of Instituto Cajal, Legado Cajal, Consejo Superior de Investigaciones Científicas (CSIC)_MADRID. The first key theme, The awakening of intelligence, focuses on the human brain and neural networks, which contribute to our intelligent, symbolic minds and our ability to invent tools. As highlighted in this section we have an audiovisual installation by the English artist Mat Collishaw, paying tribute to ‘2001’; the original ‘Arbor scientie venerabilis’ with the Tree of Knowledge by Ramón Llull (1515); several original drawings of types of brain cells by Santiago Ramón y Cajal (1899) and also the original ‘2001’ screenplay. A video recreation of the interior of the Discovery spaceship from 2001 allows the visitor to enter HAL 9000’s sphere and thus, go into The AI Universe: the second key theme, which is based around the interaction between human and machine. Above all, the focus is, on the areas of games, art, problem-solving, language, vision and independent action. The main parts of this axis are ‘The Chess Player’ (1912), by Leonardo Torres Quevedo, the first analytical machine in the world of an autonomous and functional nature with electromechanical technology; the first Kubrick letter to Arthur C. Clarke in which he suggests he collaborate on the film (31 March 1964) and the interactive DATA | ergo sum installation, by 3dinteractivo, which explores the ability to visualise and extract information from our body. 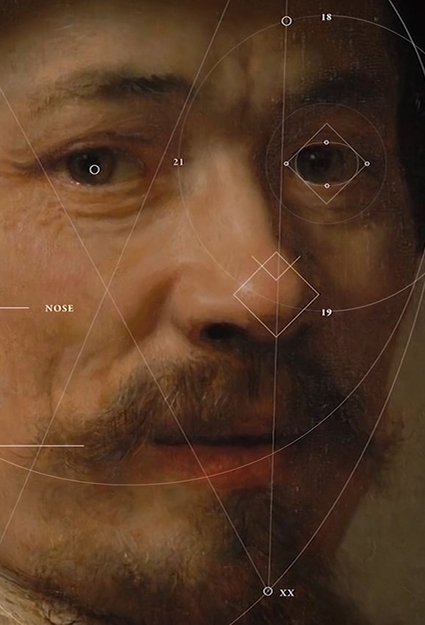 Two other works address the “creative” ability of AI: ‘The Next Rembrandt‘ (2015), a “painting” done by an AI algorithm based on the exhaustive learning of the works of the famous Dutch painter; and, in contrast, the sketching robots of ‘Human Study #1’ by Patrick Tresset, which are autonomous and create portraits in real time of people in the public. These and other exhibited works investigate both the possibility that a machine can think, its real autonomy or its mastery of human vision and language, as well as the potential of AI to control us or to change our lives. The future of intelligence and beyond infinity addresses the future of human intelligence and its relationship with AI. Research points to a future brain-computer symbiosis which will increase our capabilities or interact with technology through thought waves, which could lead to a transhumanist future. 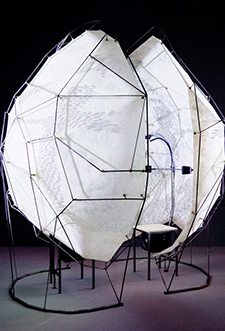 The Mutual Wave Machine installation, by S. Dikker and M. Oostrik, uses neuro-scientific algorithms to explore interconnections between the brain activity of two members of the public. The exhibition ‘Beyond 2001: Odysseys of Intelligence’ is accompanied by two participatory installations, open to the public, and a workshop programme organised by our educational team which is free for all ages.